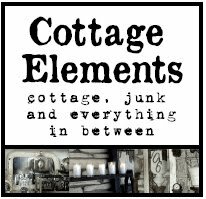 Cottage Elements: One of My Top Collectible Picks for 2012! 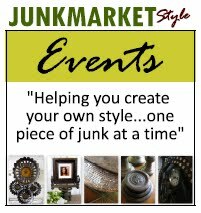 As an Editor and Contributor of the JUNKMARKET Style website, I was asked to choose one of my top collectible picks for 2012. Of course my top pick would have to be "Industrial". Does that surprise any of you, coming from me? Ha! 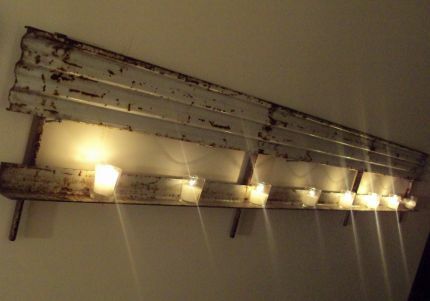 I've had a great fondness for industrial pieces and have found many ways to intigrated them into my decor. And whether it be farm industrial, office, medical or manufacturing, it seems to all work. And I simply can't get enough of it! Let me tell you, I have plenty of it in my home. And I do think it will continue to be a big collectible in 2012. 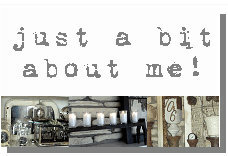 So without further ado, my top junk pick is....drum roll please.....Industrial!! This industrial desk sits on my front porch. It came out of some sort of factory. Must have been quite the factory though...love the gorgeous turquoise paint! And how about this honkin' industrial fan. It was actually handmade and is on a stand. Can you say fab-u-lous! An office file holder is a great industrial piece to display my vintage black and white family pictures. And an industrial file cabinet can have so many uses. This vase was a bottle gas cylinger cap. It's a fabulous industrial piece! Wish I knew where this piece came from. No worry, I found the perfect place for it in my kitchen to hold my recipe books. I'm very fond of medical industrial. This Torsion Balance Pharmacy Scale was a particularly great find. These laboratory beakers give a softer edge to the medical industrial. 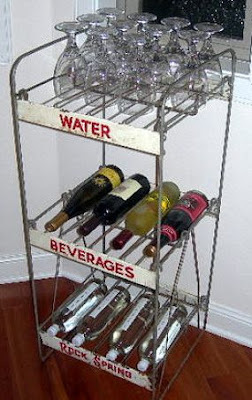 Industrial vintage store displays have great repurpose in kitchens. And of course this one has to be a wine bar! And one of my most cherished industrial pieces is this highway guard rail. Who would have thunk a guard rail could look this chic! Don't ever be afraid of industrial. It can fit into so many different styles. And it doesn't have to be hard. Soften it up with plants, painted furniture, wicker, natural woods. You may find you'll love it as much as I do! I can't decide which piece is my fave...I do love that guardrail with the votives. And the fan...and the thinga ma jig on your counter! I would love for you to come link this up tonight at the "Cowgirl Up!" linky party. Link up once, appear on 4 blogs! I am drooling such great treasures!! Great pieces. I like the file cabinet; I could use that. Holy crap I LOVE that guardrail! What great ideas!!!! There's nothing in this post that I'm not in love with! 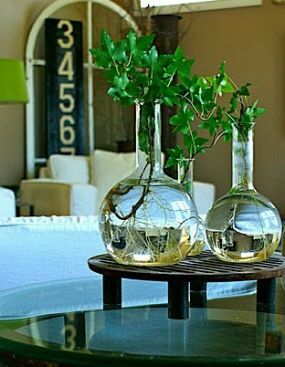 Bottle gas cylinder vase?! BEAUTIFUL! And those scales!! I feel like my style is becoming very industrial these days.